The northern most state of the Indian mainland is rightly called "Paradise on Earth". The sparkling rivers, placid lakes, gorgeous gardens and indescribable beauty of nature in the state of Jammu and Kashmir leave you completely speechless. Home to the unparalleled virgin landscapes of Kashmir, Leh and Ladakh, a travel and tourism experience to this joyous state is an unmatchable experience that will leave you feeling cleansed and pure. 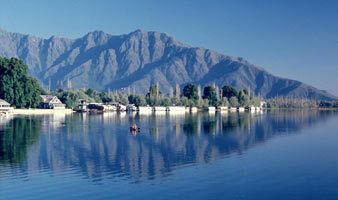 The City of Lakes, nestles in the heart of one of the loveliest areas of the country, the Kashmir Valley. Srinagar spreads out on the both sides of the river Jehlum. The Valley's beauty has enticed visitors from distant lands. Srinagar bears hallmark of the Mughals, splendid formal gardens laid out by the Mughal emperors for their enjoyment are beautifully maintained. Houseboats on the lake - the British solution to the law that prevented them from owning property, are an exciting alternative to the more traditional hotels. Srinagar is also a take-off point for some of the Kashmir's hill stations and a base for a variety of activities that range from trekking and mountaineering to fishing, golf and skiing. Kalhana , the author of the Rajtarangini states that Srinagar was founded by the Emperor Ashoka (3rd Century BC). The present city of Srinagar was founded by Pravarasena II and Hiuen Tsang who visited the capital in AD 631 found the city at the same site as it is today. Lalitaditya (AD 649-736) was the most illustrious ruler of the Hindu period, which ended in 1339. King Zain-ul-Abidin (1421-72) who was popularly known as Badshah was a great patron of Sanskrit. 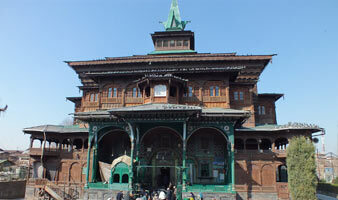 His was the period when the Kashmiri Persian literature occupied an almost exclusive place. The King was great lover of Arts and Crafts and even brought Artisans from Iran to introduce Carpet weaving, shawls and other exquisite handicrafts for which Kashmir is renowned all over the world. 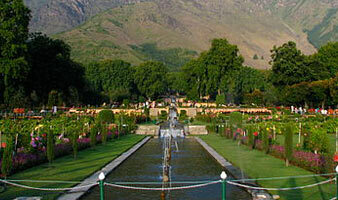 Akbar captured the valley for the Mughals who endowed Srinagar with beautiful mosques and gardens. Srinagar with beautiful mosques and gardens. The Sikhs overthrew the last Muslim ruler in the reign of maharaja Ranjit Singh in 1819. In 1846 the Dogras secured the sovereignty of Kashmir from the British under the treaty of Amritsar, and in 1947 the State of Jammu and Kashmir became part of the Indian Union. 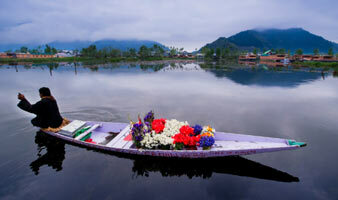 The Dal lake and river Jehlum is series of interconnected lakes and waterways make Srinagar a visula delight. The Lake is an intricate maze of waterways and open streches of water. They are delight to explore, especially in the little roofed boats called the Shikara's. 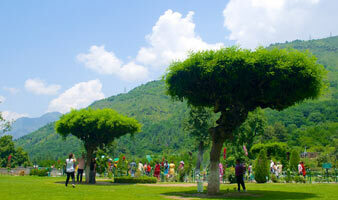 Within the lake are two islands which are popular picnic spots. Sona Lank ( Golden Island) and Rupa Lank (Silver Island) both are also known as Char Chinar because they each have four chinar trees on them planted by the Mughal Emperor Akbar. The "Jewel in the ring" is the Prettiest part of Dal lake. Crystal Clear, spring fed, away from the humdrum of busy life. The lake is supposed to be the best lake in the whole of Kashmir. Enjoy the beautiful view of mountains around the vale of Kashmir.Apart from its beauty and tranquility, Nagin Lake is an ideal place for surf-riding, water skiing, swimming and boating. Beautiful birds can be seen in and around Nagin lake and even from the houseboats as well. The splendid garden with fountains and a water channel was laid out by Emperor Jehangir for his wife, Nur Jahan ( Light of the World) in 1616and was extended in 1727 A.D by Shah Jehan, also known as "Abode of Love". During the Mughal period the top-most of the four terraces were reserved for the Emperor and the ladies of the court. The Nishat bagh has a superb view across the lake to the Pir Panjal. It was designed in 1633 by Asif Khan the brother of Nur Jahan. This "Garden of Bliss" with ten terraces has many carefully laid out flower beds and magnificent lawns and commands a magnificent view of the lake and snow capped Pir Panjal Mountain range which stands far away to the west of the valley. 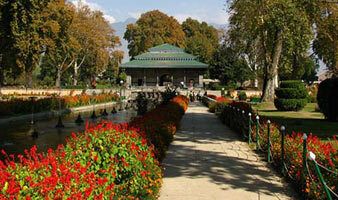 Chashma Shahi is smallest of all the Moughal gardens at Srinagar. The garden was laid in 1632 by Shah Jahan and build by Dara Shikon. Is is famous for the natural spring, the water has a property of high digestion . The people from various visit to cherish the natural water. The garden is terraced with fountains laid right through the middle. The garden is host to multiple kinds of fruit and flower plants. 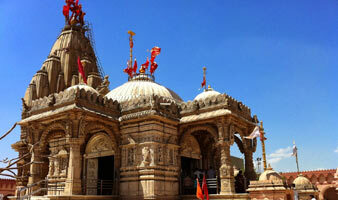 It is located at 1100ft.above surface level of the main city on the Shankaracharya hill, also known as Takht-e-Suleiman. The shiva temple, as Kalhana belives, was constructed by Raja Gopadatya in 371 B.C.and as such is the oldest shirne in Kashmir. Dogra ruler,Maharaja Gulab Singh, constructed stone stairs upto the temple. It is one of the oldest and the most spacious of all the mosques in Kashmir, situated in the heart of the city.The foundation of the mosque, an architectural wonder. This impressive wooden mosque is notable for the 300 plus pillars supporting the roof, each made of a single Deodar tree trunk. The present mosque, with its green and peaceful inner courtyard, was rebuilt to the original design after a fire in 1674. 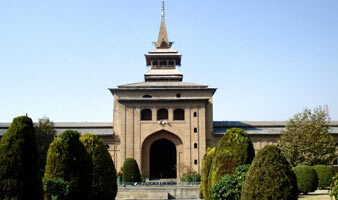 The shrine of Shah-e-Hamdan or Khanqah-e-Moulla is one of the oldest muslim shrines in Kashmir situated on the bank of the river Jhelum in the old city. Originally built in 1395, the all wooden mosque was destroyed by fire in 1479 and 1731.has fine Papier Machie work on its walls and ceilings. The present Mosque is shaped like a cube with a Pyramidal roof rising to a spire and has fine Paiper Machie work on its walls and ceilings.